That trip just flew by 😦 But not before I could take some grand pictures! I’m going to be using some Irish slang in my post, see below for translations. I had some good craic in Dublin. * But Irish food isn’t much to get excited about. To be honest with you, the only places you can really get some real Irish grub is in the pubs — but Dublin has 900 pubs!! So ya, I guess you can get Irish grub on every street corner, but I’m more of restaurant gal and so I ate much more than Irish grub during my time in Dublin. 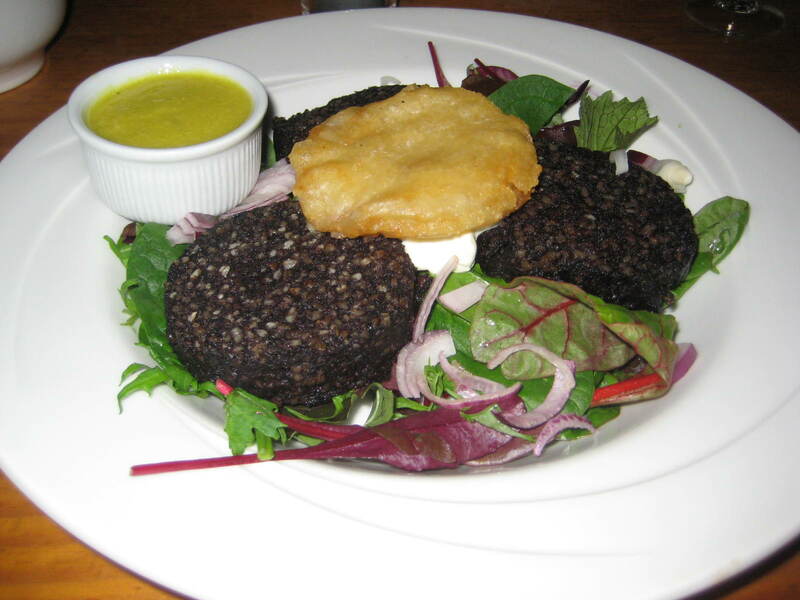 At one of the Irish pubs/restaurants I visited, I decided to be adventurous and order Clonakilty black pudding. For those of you who don’t know what black pudding is, it’s not at all what you think. 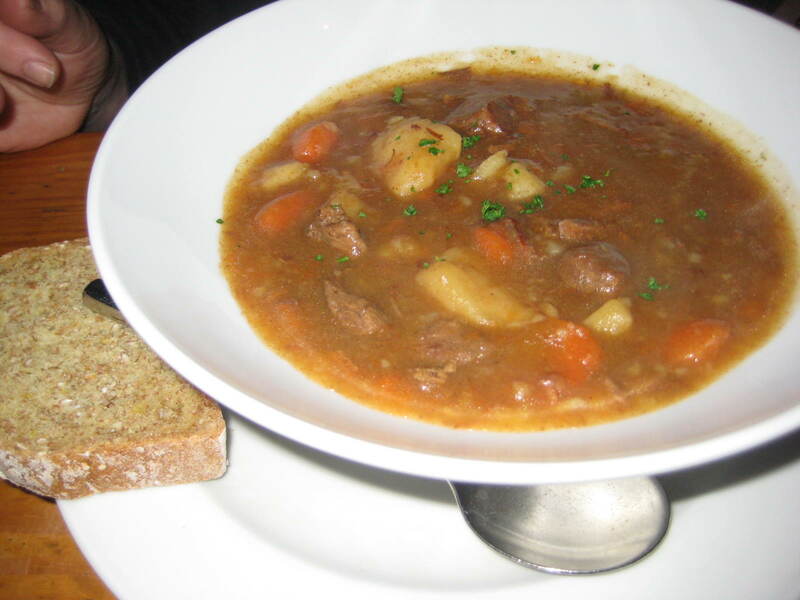 I also ordered Irish stew, made with none other than Guinness beer. This dish was good, but I have to admit, I didn’t think it was that grand. 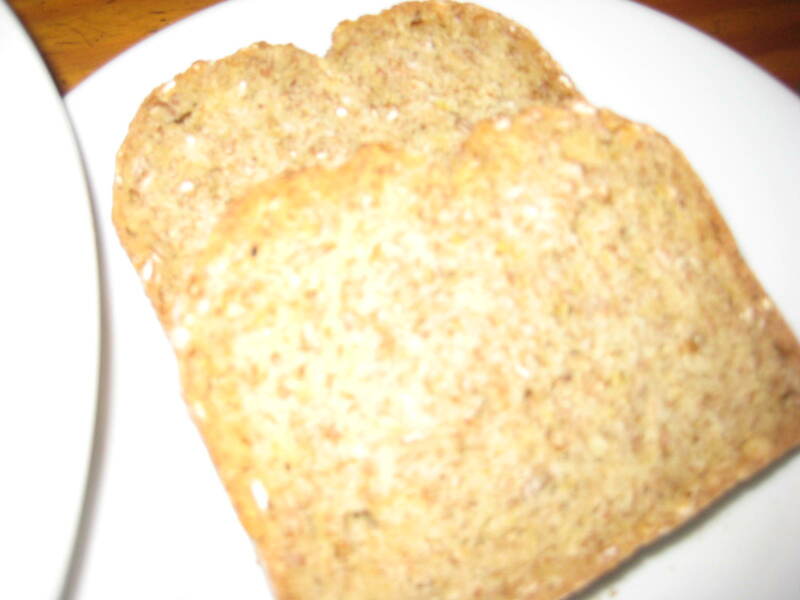 All our dishes were served with Irish soda bread. This bread is very, very dense — it is made with buttermilk and baking soda. Dublin is so brill! The city’s average age is only 25 years old, mainly because Dub is home to the country’s three largest universities. Contrary to what you may think, or at least what I originally thought, Irish people aren’t wellied all the time. Irish people are extremely polite and very proper. They would never shout obscenities at women, as drunk Torontonians often do, and they are so friendly! Now for some non-Irish grub. 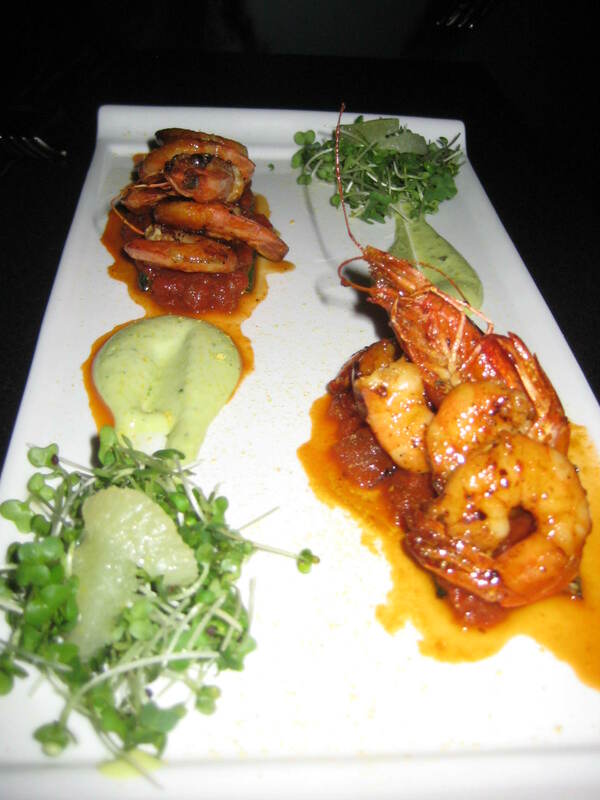 This dish here is just an app — pan seared gambas (prawns), with sweet chili dressing, char-grilled courgette, tomato chutney, & basil aioli. 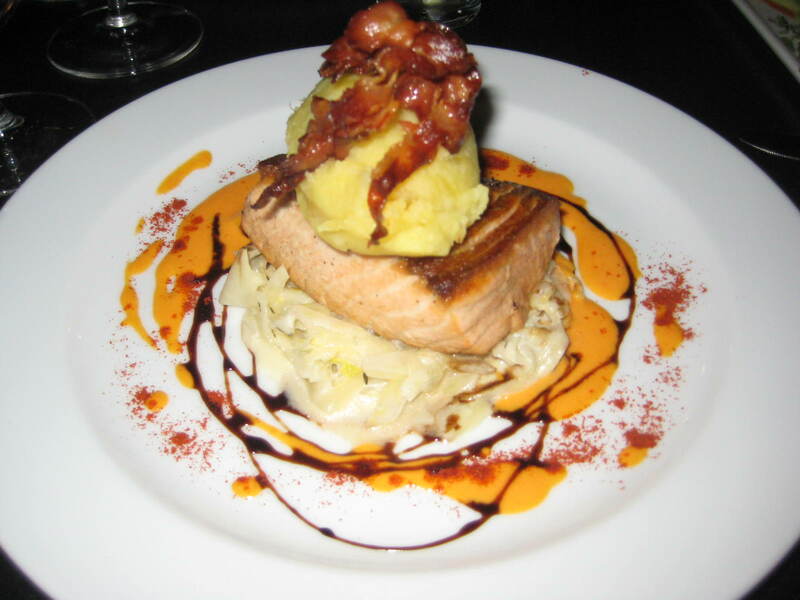 This is from a grand restaurant in Monkstown, just outside of Dublin, called Seapoint. 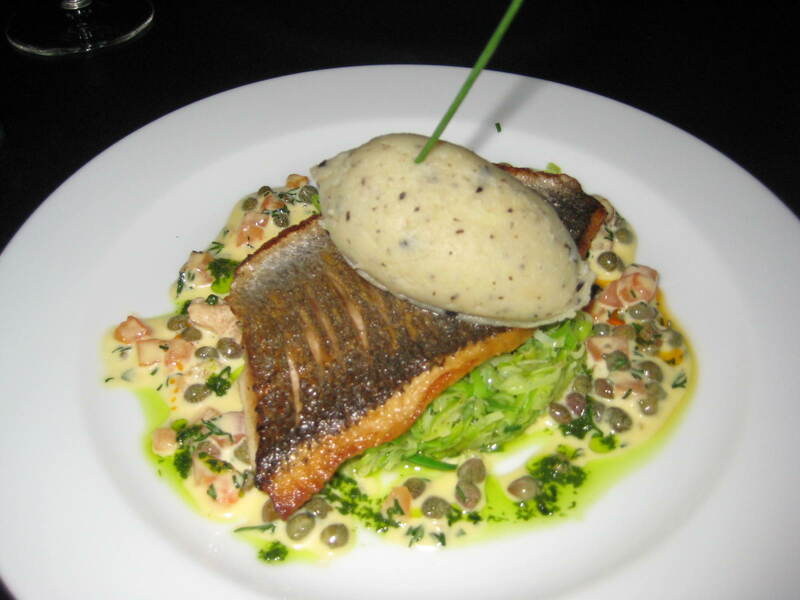 This is the grilled sea bream, with saute leeks, tapenade mash, tomatoes, capers, and dill beurre blanc. Finally, whoever said chicken was boring? 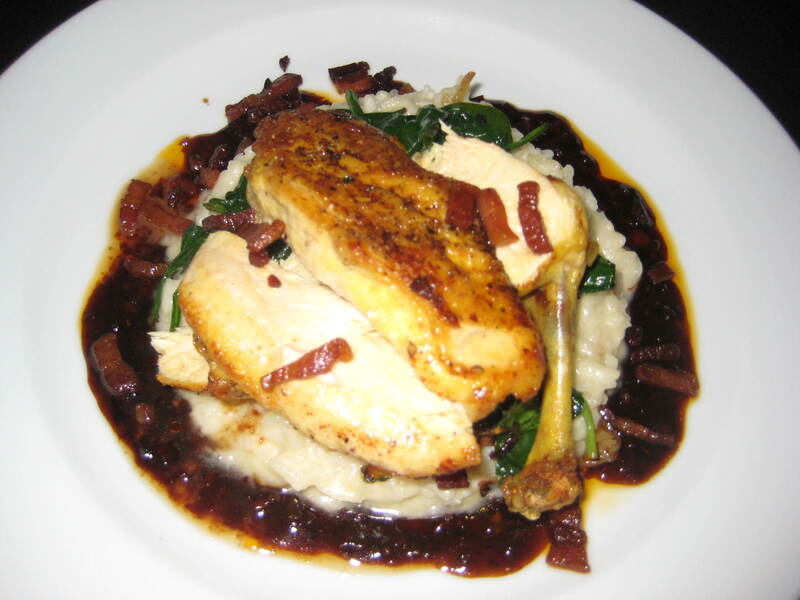 Corn-fed chicken, smoked bacon and lemon thyme risotto, buttered spinach, chili, coriander, and ginger jus. Now I had to ask, why is this restaurant advertising that they use corn-fed chicken? The chef informed me that they choose to use corn-fed chicken because it produces a juicier, meatier product, which yes, is very true. After seeing Food Inc. though, I think most of us now know that when farm animals (cows, chicken, etc.) are fed corn, they become much fatter, therefore, producing more meat. However, these animals don’t enjoy eating corn. In fact, they hate it! They prefer grass – which is why most people are opting to buy grass-fed meats. This is the sustainable option. *I had some good craic (pronounced crack): I had a jolly good time! That’s all for now, more pictures to come. what beer did you get wellied from?